When the heat of summer has your temperature rising, you can still enjoy tasty meals without ever turning up the heat in the kitchen. After all, why slave over a hot stove or consume heavy fat-laden fast foods when an easy-to-prepare, no-cook meal can lighten your load. With a little chopping and slicing, you can quickly turn vine-ripened juicy tomatoes, fresh broccoli, crisp cucumbers, aromatic herbs and succulently sweet fruits into a nutritious and delicious feast for the eyes as well as the appetite. Think refreshing cold soups, cool hearty wraps, colorful slaws and main dish salads. Combine the convenience of no-cook pantry all-stars and you’ve got all the makings for a fast and fabulous meal that doesn’t require cooking. Deli meats, canned tuna or chicken, pre-cooked shrimp or crab, canned beans, artichoke hearts, olives and roasted red peppers are a great resource in preparing delicious and healthy cool meals. Even foods that require cooking can be used as an ingredient in your no-cook feast. Couscous, bulgur or dried Asian noodles only need a brief soaking in hot water to use. For pasta with more substance, heat water to a boil in the microwave, stir in the pasta of your choosing, then cover and let sit for 15 to 30 minutes (depending on the pasta type) for pasta al dente that’s ready to go. Go ahead—turn off the heat and stay cool in the kitchen without breaking a sweat. All you need is a hungry appetite and the tasty ingredients listed in the recipes that follow to enjoy summer at its best. Vary the look and texture of this slaw by finely shredding, or coarsely shredding, the vegetables. Or, cut the vegetables in wide sections the width of the feed tube and stack horizontally to make long shreds. * Spice it up and substitute half of the beets with daikon radish. Toss the zucchini, carrots, beets, fennel and cabbage together in a large serving bowl. To make dressing, whisk together both oils, lemon juice, rice vinegar, soy sauce, sugar, ginger root, and 2 teaspoons sesame seeds together in a small bowl until thoroughly blended. Add salt and pepper, to taste. Pour the dressing over slaw and toss until well coated. Sprinkle the remaining teaspoon of sesame seeds over the slaw and serve. Makes six to eight servings. In a large bowl, mix together the spinach, tomatoes, carrots, zucchini, beans, feta cheese, and cooked rotini pasta. Whisk together in a small bowl the olive oil, lemon juice, chives, thyme, rosemary, garlic, pepper and salt. Pour dressing on top of the veggie mix; toss together until thoroughly coated and serve. Makes four to six servings. 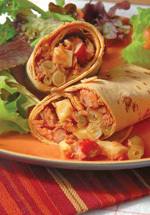 * For something different, serve in pita bread, a tortilla or any flavored wrap. In a large bowl, toss together salmon, cheese, three-bean salad and lettuce. In a small bowl, whisk together balsamic vinegar, sun-dried tomato oil, sun-dried tomatoes, pepper and garlic. Pour vinaigrette over salmon mixture and toss to combine. This is not your everyday pizza, but it’s certainly a pizza worth having everyday as it’s super easy to make and super delicious to eat. OK, I cheated a bit by heating the fruit sauce in the microwave, but you’ll never notice the heat in the kitchen. Blend together the ricotta cheese, cream cheese, 2 tablespoons sugar, and vanilla extract. 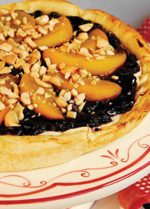 Spread cheese mixture evenly over crust, leaving a half-inch border. In a microwave-proof bowl, combine the berries, cornstarch and remaining 2 tablespoons sugar; toss to mix well. Heat on high for 2 to 3 minutes (depending on your microwave’s wattage) until sauce thickens. Let cool slightly and spread thickened berry sauce evenly over pizza.